SchoolCity SUITE offers a variety of electronic repositories of data, or banks, in which users can choose questions items and passages to create an Item Bank Assessment. 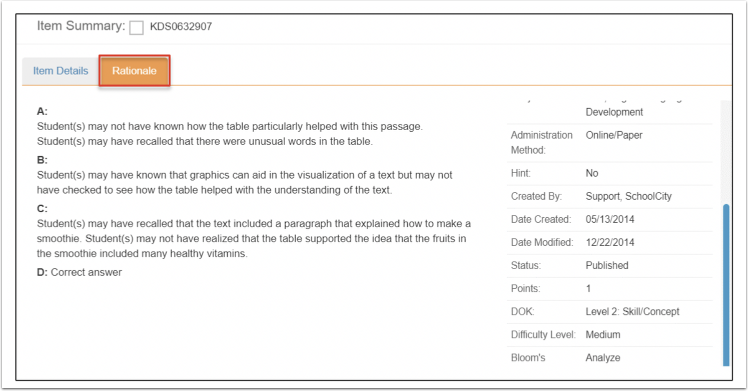 Users may also create items and passages in the Work Space for use in an assessment. 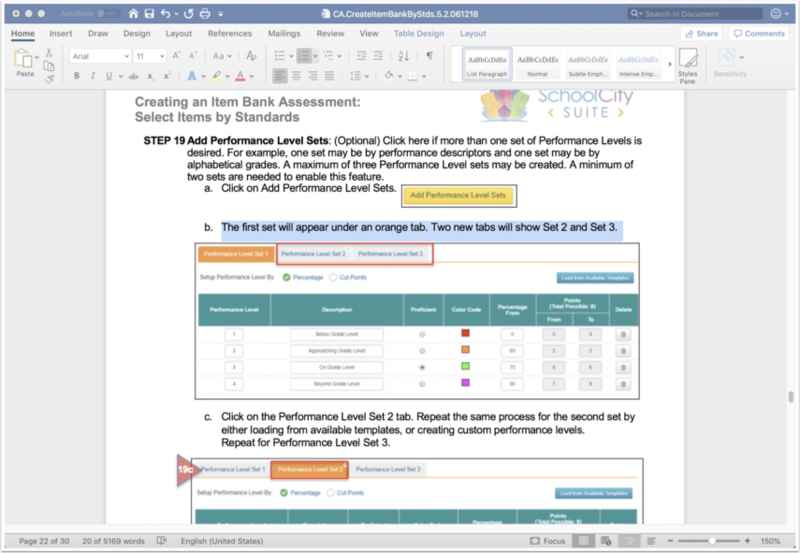 An Item Bank Assessment may be aligned to standards, include a number of different question/item types, administered and scored online, or administered on paper with a scannable answer sheet and scored using SchoolCity Scan and a supported scanner or GradeCam™ technology. From the Top Menu Bar, select Assessments. Click on Create Assessment, then select Item Bank. 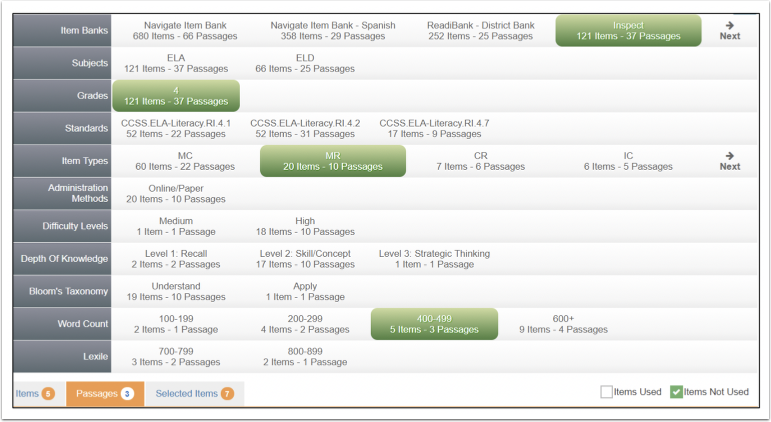 Or, from the Launchpad, click on the CREATE ASSESSMENTS Flip Card. On the reverse side, select Item Bank. School Year: The new assessment will default to the current school year. To select another year, click on the current year and select the correct year from the drop down. 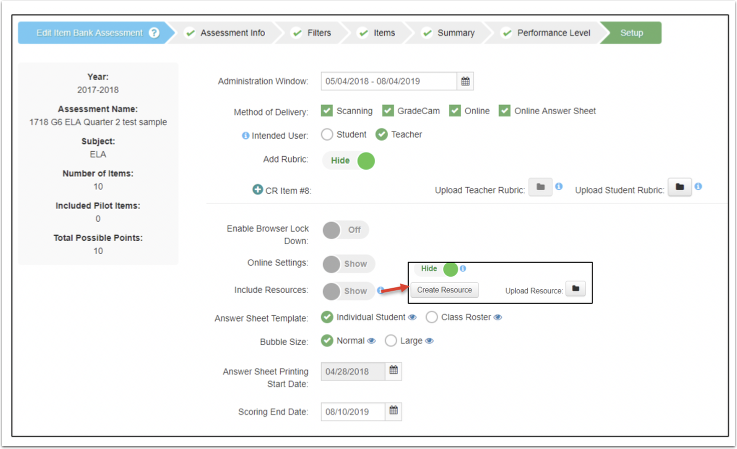 Assessment level: Depending on your role and permissions, you may be able to create assessments for your class only, and/or at the School and/or District level. Select the level appropriate for this assessment, if a selection is available. Assessment Name: Enter the assessment name. The assessment name should be unique and clear to you and anyone you may decide to share with. Existing Collections (optional): Assessments may be organized into “folders” called Collections. You can add an assessment to an existing collection or create a new collection. 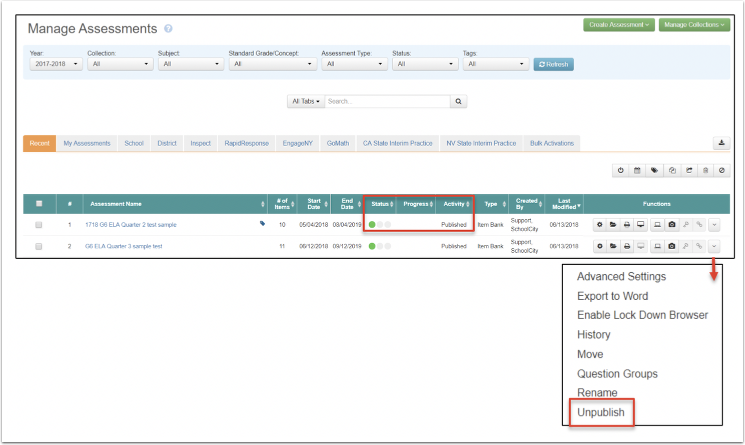 Tag Assessment (optional): Give your assessment a tag for easier search capability in the Assessment Manager. Schedule all students: If you are a teacher level user, then all students are all students on your roster(s). If you are a school level user, then all students are all students in the school. If you are a district level user, then all students are all students in the district. Schedule students by Course Group or Course: Use this option if you have created Course Groups in the Group Manager or would like only students in a specific Course or Courses to take the assessment. Save/Next: Click on Save if you are done with your selections and wish to exit the system to return at a later time. Click on Next, to go to the next step. Your work will be automatically saved. 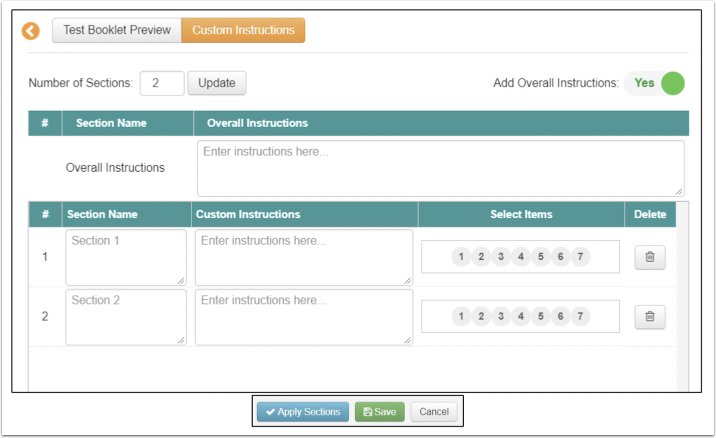 The next step in the creation process is to determine the filters for the items you want on the assessment. Select Items by Standards or Select Items by Criteria: This document will focus on Select Items by Standards. Select Standards: For ELA, the standards your state uses will populate by strand, then grade. 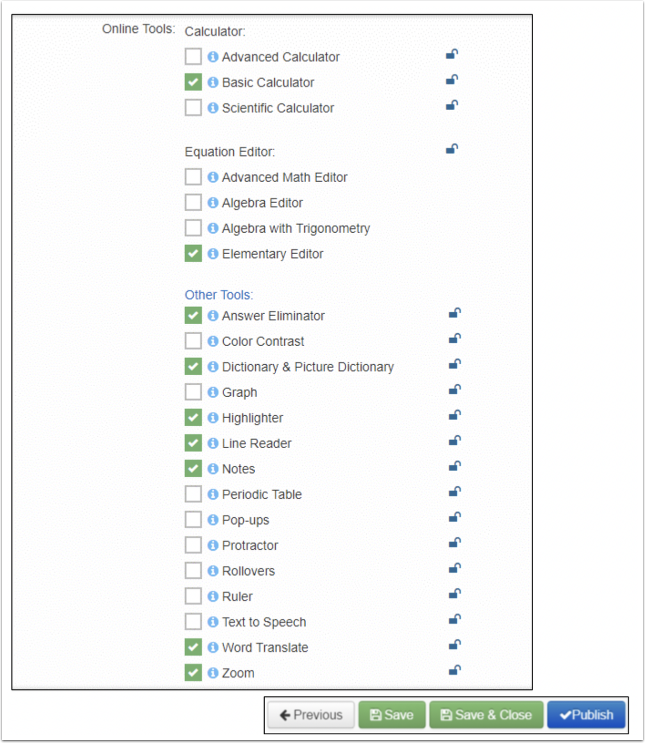 For Math and other subjects, grade levels will populate first, then domains or topics. Select grade: Select the desired strand/grade/domain/topic and the standards will appear on the right-hand side. Standards: Select the appropriate standard(s) from the list by checking the open box next to the standard number. The box will change to green with a white checkmark. Item Bank Items: The number of items in the available Item Banks for each standard will be shown in green in brackets. 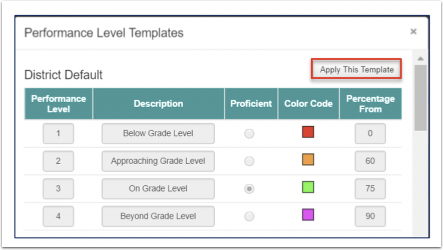 Add Subjects: If you want the assessment to include standards from other subjects, select Add Subjects button to see a menu of other Standard Sets that are available. Select the Standard set you want and then select the standards. The next step in the assessment creation process is to select the items for the assessment. Items: The items shown match your selected standard. Scroll down to see all items. Modify: If you need to revise the chosen criteria, click on Modify to return to the previous step. Item Used/Not Used: Check the Items Used box to show items that have been used in another assessment. Uncheck to hide those items. (See below) Check the Items Not Used box to show items not used in another assessment. One or both boxes may be checked. 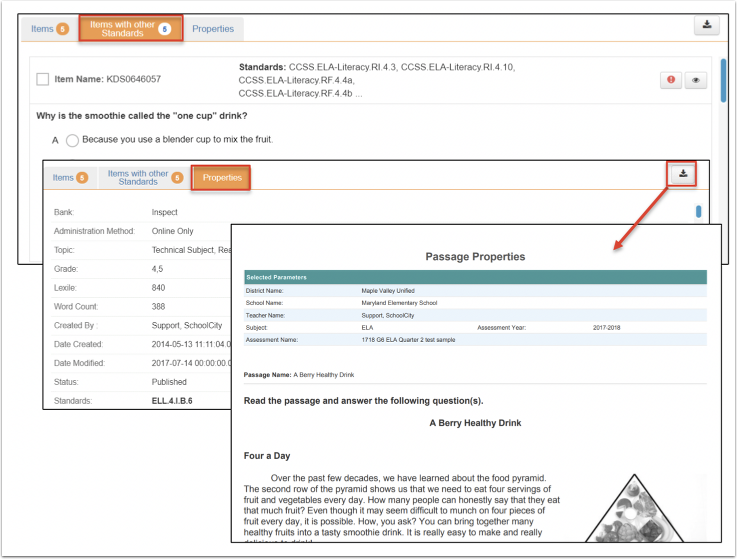 When the Items Used box is checked and the Items Not Used box in unchecked, then the Assessments that include an item can be viewed. Click on the Check to view the Items in Use - Assessment List. By showing the filters, you can see specific details about the total number of items and passages. 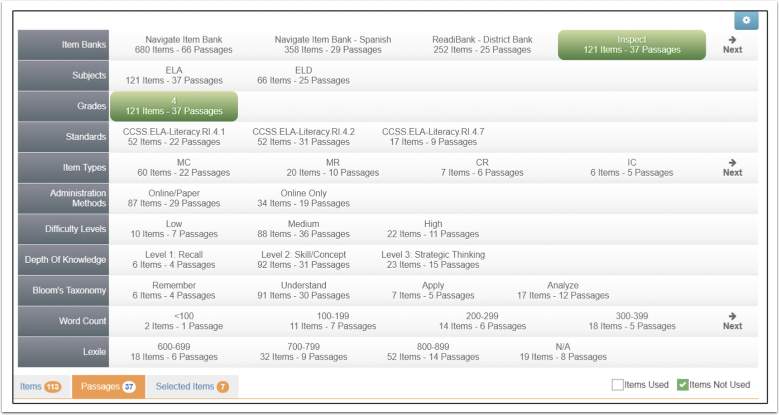 Item Banks: The Item Bank(s) your district has licensed will display showing the total number of items and passages that match the chosen criteria. Subjects: In ELA, there may also be matching items in English Language Development, or Science and History/Social Studies, depending on the selected standards. Grades: The chosen grade or a range of grades may be shown as some items/passages are appropriate for a range of grades. Standards: All standards to which the items/passages are aligned will be shown. Totals: The total number of items and passages display according to Items Used/Not Used filters. Select filters: To begin narrowing down the number of items/passages choices, select the specific item bank(s), subject(s), grade(s), and standard(s) by clicking on the title, which changes to green when selected. Scroll down to see all items. Click on the gear icon in the top right-hand corner, and a drop-down list of additional filters will appear. Add/Remove Filters: You can further filter the original set of items and passages by selecting one or more filters. Select the desired filter(s) from the list by checking the box. Update: Click on Update to add the new filters. An additional row for each filter will appear under the Standards row. The number of items and passages aligned to the selected standards within the specific filter will display. Click on any filter, or combination of filters to focus your item selection. Unclick the selected filter to remove it and then reselect another. At any time, you can open the gear icon to remove filters you do not want or need. Constructed Response (CR): Requires a written response from the student which is normally graded using a rubric. Evidence-Based Selected Response (EBSR): Determine correct answers in a two-part question where Part B is the text evidence for Part A. Gap Match (GM) and Graphic Gap Match (GGM): Drag and drop the correct answer in the specified place. Graphing Lines (GL): Draw lines on a graph according to the information in the problem. Graphing Points (GP): Plot points on a graph according to the information in the problem. Hot Spot (HS): Choose the answer by clicking on the correct spot. Hot Text (HT): Choose underlined parts of a text as the correct answer(s). Inline Choice (IC): Choose from a drop-down list of possible answers within a sentence. Matching Table (MT): Decide if each answer choice in a table answers the question. Multiple Binary (MB): Decide whether each answer choice is true/false, yes/no, or correct/incorrect. Multiple Choice (MC): Choose one correct answer from a number of answer choices. Multiple Response (MR): Choose two or more correct answers from a number of answer choices. Number Line (NL): Plot points on a number line. Number Line Dot Plot (NLDP): Complete a line plot that displays data given. Numerical Response (NR): Use a number pad to enter the correct answer if online, complete a griddable template if on paper. Order Items (OI): Place answer choices in the correct order. Click the View icon (eye) to see more details about a specific item. View the Properties on the right. Use the scroll bar to view all properties and aligned standards. Click on the Passage name in blue font to preview it. You can view all items connected to this passage, items aligned to other standards, and passage properties (See Step 8). View the Rationale (if available) as to why students might select the incorrect answers. Click on the Passages tab to view each passage and associated items. Scroll down to view all items. View all Items aligned to the standards selected in the Filters step for this passage. Click on Items with Other Standards to view more items aligned to other standards than what was selected. Click on Properties to view details about the passage. Export to PDF by clicking on the download icon. Report an error: If you find an error in an item grammar, conventions, standards-alignment, incorrect answer, or other problem, please let SchoolCity know. Click on the red exclamation point icon to send an email. The number of items selected for each standard will display on the left-hand side of the screen. A Selected Items tab will appear as soon as one item is selected. Click on this tab to view all selected items. Items can be deleted by unchecking the box next to the Item Name. Previous/Save/Next: Click on Next after you have selected all items and you wish to continue with your assessment creation. Your work will be automatically saved. If you are done with your selections and wish to exit the system until a later time, click on Save. If you need to go back to the previous step, click on Previous. The Summary is the next step in the assessment creation process. It provides an overview of the assessment. Standard selection: At least one standard must be selected for each item. All aligned standards will be listed including those chosen in the Filters step. Choose the standard(s) you want for reporting purposes by clicking in the box next to the standard number. Points: The number in the box represents the default setting from the Item Bank. If the box is white, you may change the point value by clicking inside the box and entering the desired value. Because of the scoring rubric for CR items, the point value is set and cannot be changed, as indicated by a gray box. 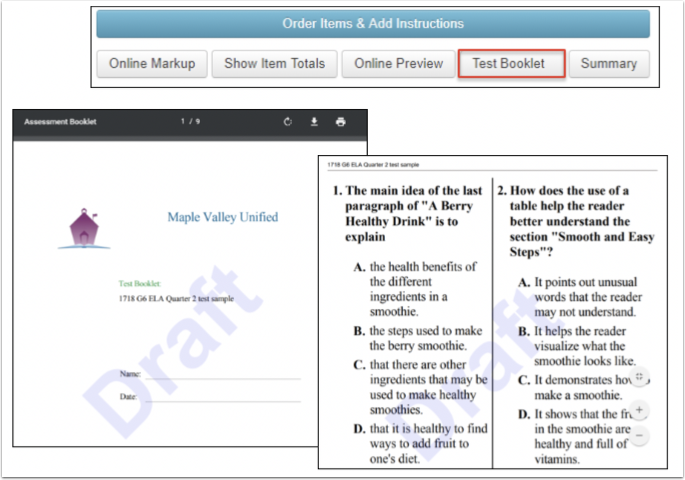 Order Items & Add Instructions: Click on the blue bar to customize the Test Booklet (See Step 11). 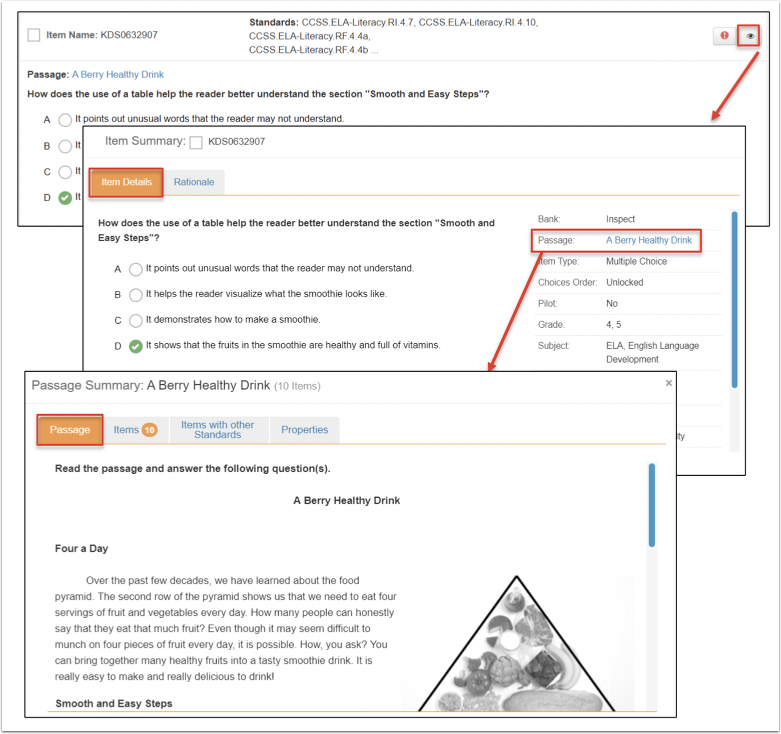 Online Markup: Click here to add Text to Speech reading functionality, create support content for Pop-ups or Rollovers, and/or add resources (See Step 12). 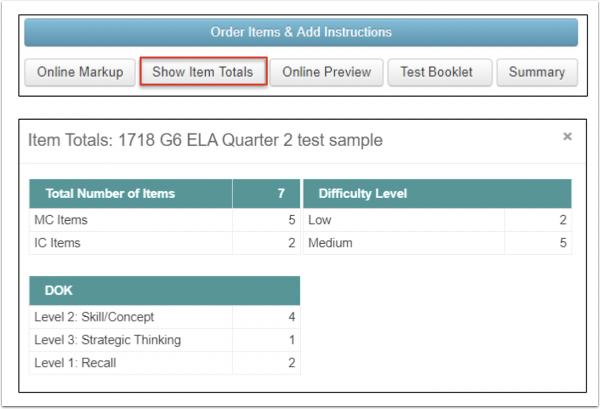 Show Item Totals: Click here to see a summary of the Items Types, DOK Levels, and Difficulty Levels (See Step 13). Online Preview: Click here to preview how the assessment will appear in the Student Portal (See Step 14). Test Booklet: Click here to preview a draft of the student test booklet for paper administration (See Step 15). Summary: Click here to view a draft of the summary of the assessment (See Step 16). Previous/Save/Next: On the bottom right, click on Next after you have made all your selections and you wish to continue with your assessment creation. Click on Save if you are done with your selections and wish to exit the system. Click on Previous if you need to go back to the previous step. Click on the blue bar, Order Items & Add Instructions. Items Numbering: The items appear in the order they were selected in the previous step. You can reorder the items automatically or manually. Auto allows you to reorder by dragging and dropping them into the correct order. Manual allows you to reorder the items by typing in the number next to each item. 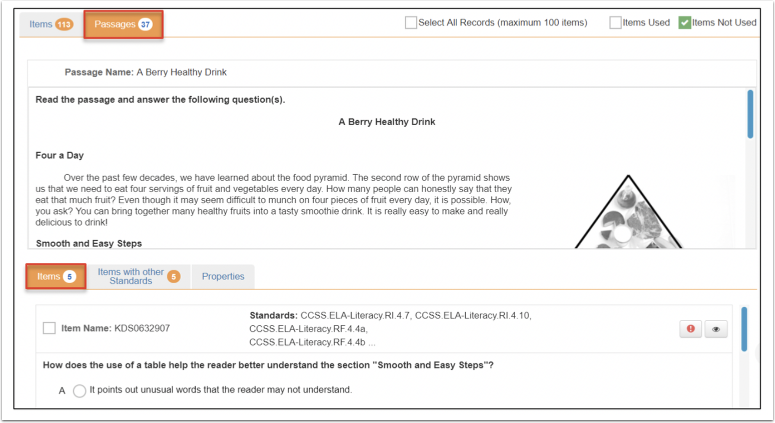 Test Booklet Preview: Click on the orange arrow to maximize the preview. Scroll through the Test Booklet, download, print, or zoom in or out by using the icons on the right. 2 column layout: Slide No to Yes to reorganize the items into two columns (if allowed by item type). Click Save and Update Test Booklet to view the changes. 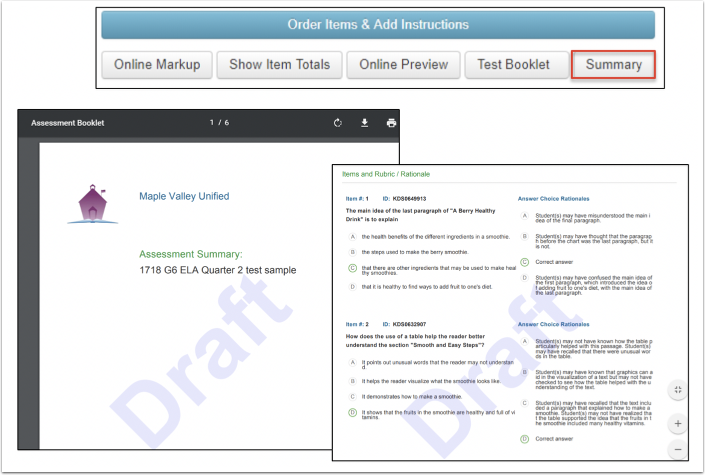 Custom Instructions: Click on Custom Instructions to organize the Test Booklet in sections with specific instructions. Number of Sections: Enter the desired number of sections, and click Update. Overall Instructions: Slide No to Yes to add overall instructions. Name each section, enter instructions, and indicate which items belong in the section. Click on Online Markup to set Text to Speech, create Pop-ups and Rollovers, and add Resources. Delete Markup removes all markup from the current screen or from the entire assessment. Text to Speech (TTS): Set TTS for both passages and items, or only one or the other by checking the box next to each. Pop-up: Used for definitions of words or phrases. Highlight text for which you want to add a Pop-up, then click on Pop-up. Enter the Pop-up Content, then click on Add Markup. The pop-up will display as an underlined word in the text. Students will click on the word and the Pop-up will appear directly above the word or phrase. Rollover: Used for phrases or sentences. Highlight text for which you want to add a Rollover, then click on Add Markup. The Rollover will display as an arrow to the right of the sentence. Students will click on the arrow and the Rollover will appear above the original sentence or phrase. Resources: Click on the Download icon to upload a PDF of a resource for a specific item or for the test as a whole. Once uploaded, the download icon will be green. Click on the + icon to create a resource for an item or whole test. Name the resource and use the CKEditor formatting tools to create the resource. Use the trashcan icon to delete a resource. Click on Save & Preview to view the resource from the students’ point of view, or Save. Click on the World icon to view the resources, then click on the name to view. The item totals show how many of each item type you have selected, the number of items in each DOK Level, and the number of items in each Difficulty Level. Go back to the Items step if you want to reselect items to change the types, DOK or Difficulty levels. This is a preview of the student booklet for paper/pencil administration, or for printing a hard copy of the assessment. The booklet will be stamped Draft until the assessment has been published in the last step of the creation process. Once published, a PDF of the test booklet will be automatically uploaded in the open folder icon in the Assessment Manager where it can be accessed for printing. The Summary document includes an Assessment Summary section, a Standards Summary section, and an Items and Rubric/Rationale section. The Summary is stamped with Draft until the assessment is published in the last step of the creation process. Once the assessment has been published, a PDF of the summary will be automatically uploaded in the open folder icon in the Assessment Manager where it can be accessed for printing. If available, you can use an existing template, or customize performance levels as desired. Performance levels help users to interpret their assessment data in reports. Click on the Performance Level Set 2 tab. Repeat the same process for the second set by either loading from available templates, or creating custom performance levels. Repeat for Performance Level Set 3. To delete Set 3, click on the x in the upper right corner of the tab. An alert message will appear. Click Delete to continue. To delete Set 2, click on the x in the upper right corner of the Set 2 tab. A different alert message will appear. 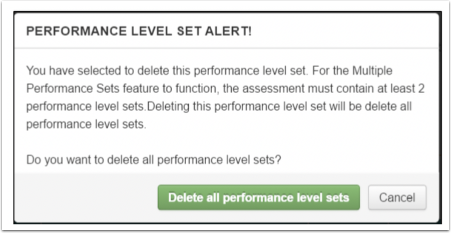 Deleting all performance levels will NOT delete Set 1. You may choose to create your own performance levels by percentage or by cut points instead of using an existing template, or to modify an existing template. Previous, Save, and Next: Click on Next after you have made all your selections and you wish to continue with your assessment creation. If you are done with your selections and wish to exit the system click on Save before exiting. If you want to go back to a previous step, click on Previous. The final step in creating the assessment is to determine the administration details. Method of Delivery: Scanning and GradeCam are paper/pencil methods using a scannable answer sheet. Online assessments are administered through the Student Portal. More than one method may be selected. Depending on the selected item types, online may be the only delivery option. Intended User: If you are administering the assessment with an Online Answer Sheet, you must indicate the intended user Student or Teacher. Student means that students will be completing the test online in the Student Portal. Teacher means that the teacher will enter the students’ answers on a Student Answer Sheet (online) after students take the test on paper. This is intended to be used by teachers whose students may have difficulty bubbling in the answer sheet on paper or online themselves. Add Rubric: The Constructed Response (CR) items selected from an Item Bank include a scoring rubric. This can be deleted by sliding Yes to No, and adding a custom rubric for Teachers and Students, if desired. Online Settings: If you are administering the assessment online, slide Show to Hide to view the online settings (see details below). Include Resources: If you want to add one or more resources to the Test Booklet, slide Show to Hide. Upload a PDF by using the folder icon, or create a resource. Answer Sheet Printing Start Date: Determine the date when answer sheets can be printed before the window start date. Scoring End Date: Determine the ending date that Constructed Response (CR) items can be scored, or student answers can be entered in the Online Answer Sheet, after the closing of the Administration window. Online Settings: Slide Show to Hide to show all settings. Click on the icon to view a brief description of each property or tool. Restrict Users: Click on the padlock icons to the right of any property/tool to prevent (locked) or allow (unlocked) other users from changing the online settings. Duration: (optional) Slide No to Yes to include a duration for the assessment. Determine how many hours/minutes you want to allow students to complete the assessment. Time may be added or deleted during the test. Default Time Increment: (If Duration is added.) The duration can be increased or decreased by a set number of minutes as needed during the testing session. To change the default setting, click inside the number box and use the up/down arrows to select a new time. Time Window: Set the beginning and ending time students will be able to access the assessment in the Student Portal. To change the Start Time and/or End Time, click on the clock icons. Days Window: Select the days of the week the assessment will be available to students. Click on the box next to the day to deselect (if green) or select (if open). Display Item Details in Student Portal: Pre-selects display of item details in Student Portal when reviewing scores. This can be turned on or off at a later date after all students have taken the assessment in Advanced Settings. 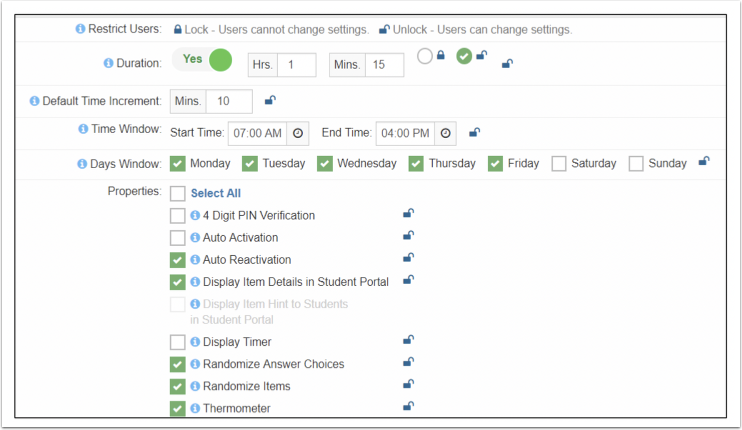 Display Item Hint to students in Student Portal: The hint feature is only available for Multiple Choice items created in the Work Space. Upon completion of a test, all items for which the student has answered incorrectly will be tagged for a second attempt. During the second attempt, a hint for each incorrect item will display and the initial incorrect response will not be available. Display Timer: Pre-selects the display of the timer (countdown clock) in the Student Portal. Randomize Items: Pre-selects the randomization of items on the assessment. Thermometer: Pre-selects the display of a thermometer that visually shows the score when students submit their assessment in the Student Portal. Online Tools: When selected, these tools will appear in the Student Portal for students to use while taking the online assessment. Calculators: The three levels of calculators are Advanced, Basic or Scientific. Only one may be opened at a time. Tutorials on using each of the calculators can be viewed at http://learn.desmos.com. Equation Editors: The Equation Editor is part of the CKEditor text box formatting tools. There are four levels of editors: Elementary, Algebra, Algebra with Trigonometry, and Advanced. Students can use the CKEditor to write the equation in the space provided and click OK to enter it into the text box for scoring. Color Contrast: Allows students to adjust screen background or font color based on student needs or preference. Dictionary & Picture Dictionary: Word dictionary and picture dictionary tools to help students to look up words during online testing. Highlighter: A tool to highlight text in various colors. Pop-ups: Allows pop-up set-up in the mark-up panel to be viewed during online testing. Applies to online Item Bank assessments only. Rollovers: Allow rollovers set-up in the Markup Panel to be viewed during online testing. Applies to online Item Bank assessments only. Ruler: A ruler to measure length in images (centimeter and inches). Text to Speech: A tool to read text aloud to students in the student portal. Word Translate: Word translate tool for students to translate words during online testing. Zoom: A tool to enlarge or shrink text. Previous, Save, Save & Close and Publish: If you are done with your selections, but are not exiting the system click on Save. If you are not ready to deliver the assessment and plan to make edits, and are exiting the system, select Save & Close. You may publish later from the Assessment Manager screen. If you need to go back to a previous step, click on Previous. 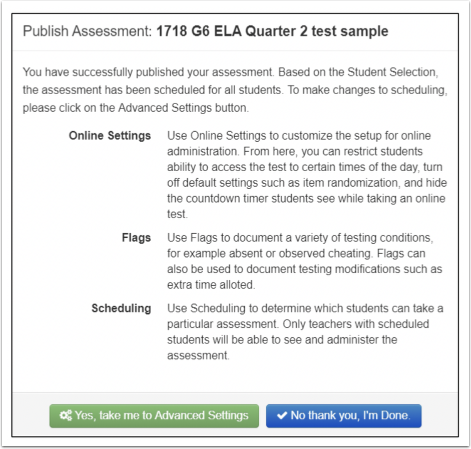 Select Publish if the assessment is ready to administer to students. The new assessment will be listed in the Assessment Manager under the tab in which it was created: My Assessments, School, or District. Assessments you have recently created or have been working with may be listed under the Recent tab. If published, it will display with a green dot and Published in the Activity column. To revise the assessment, click on the gear icon to return to Setup. The PDFs of the final Student Booklet and Summary document are housed in the open folder, under Functions. Click on the folder to view the documents. If published, the assessment must be unpublished before any changes can be made.